Can’t decide between the exfoliation options? Professional or At-Home? Let us direct you in the right way. Are you familiar with microdermabrasion? Microdermabrasion uses physical exfoliation to help slough away the top layer of skin to give it a healthy glow and help increase cell turnover. Most of us have visited a spa or been to a dermatologist for a professional exfoliation treatment at some stage of our lives. If so, you may have loved how each and every dead skin cell was removed and may have benefited from softer skin, less noticeable fine lines and even a reduction in acne. What if we told you that you could get all of those same benefits of a professional treatment for a much less of a financial commitment with results, by using an at-home microdermabrasion product? Yes, totally achievable! Let us help you turn your bathroom into a getaway and effective treatment zone. 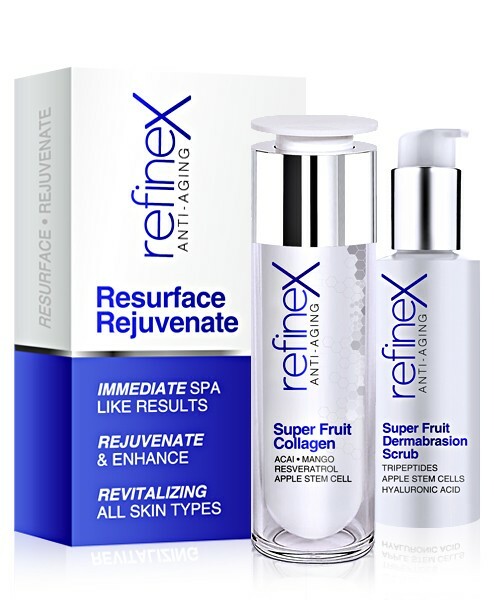 With gratitude to a team of professionals at Naturalskinshop.com who have been on a mission to finally unite an at home spa treatment kit that will satisfy ones needs and give results like you just had a facial.Refinex Resurface and Rejuvenate: Home Spa Set, is a must have. Which consist of Super Fruit Microdermabrasion Scrub , combining the power of super antioxidant fruits, clinical grade microdermabrasion crystals, and potent chemical exfoliators to produce smooth, glowing skin. It has been unified with a powerful anti-aging, collagen stimulating serum for ultimate results in age correction. The Super Fruit Collagen Serum penetrates deeply to hydrate the skin, instantly plump, and maintain healthy water content in the skin. This serum provides instant, long lasting hydration, skin nourishment, and antioxidant protection against environmental aggressors. Bringing together these two great products assures spa-like professional results. With persistent use that will result in rejuvenating, fading fine lines, wrinkle, sun damage, age spots and clearer pores with fewer blemishes. Both men and women can take advantage for these professional results achieved from the Refinex Resurface and Rejuvenate: Home Spa Set from Naturalskinshop.com.